A self-guided scavenger hunt in Whakatāne, New Zealand, the Kiwi Capital of the World! Whakatāne is known as the Kiwi Capital of the World thanks to how close North Island brown kiwi live to our town. But our feathered neighbours are masters of camouflage and hide-n-seek, so not everyone realises Whakatāne has so many kiwi. 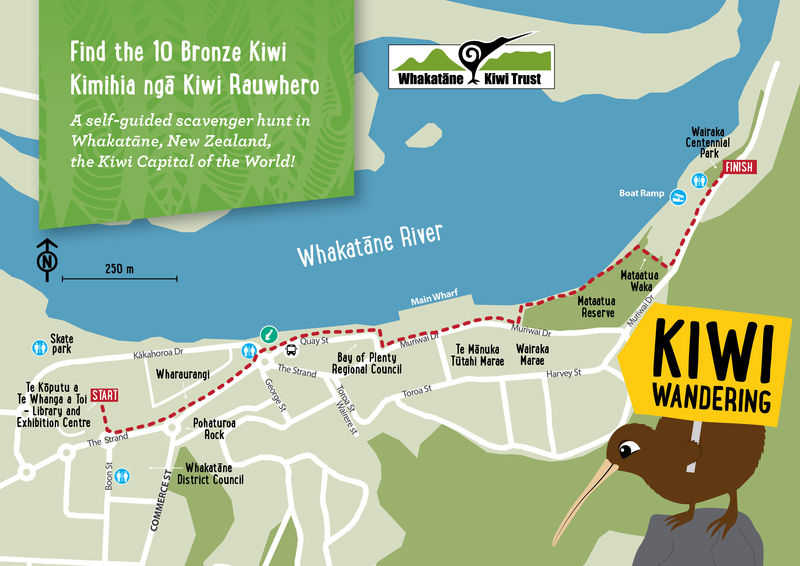 Enter the Kiwi Wandering Trail: ten life-like, life‑size bronze kiwi statues which wander right through the heart of Whakatāne. The bronze kiwi sculptures form an educational walk, fit for families and people of all abilities, while also reminding the residents of Whakatāne that we have real live kiwi wandering in our backyards too! 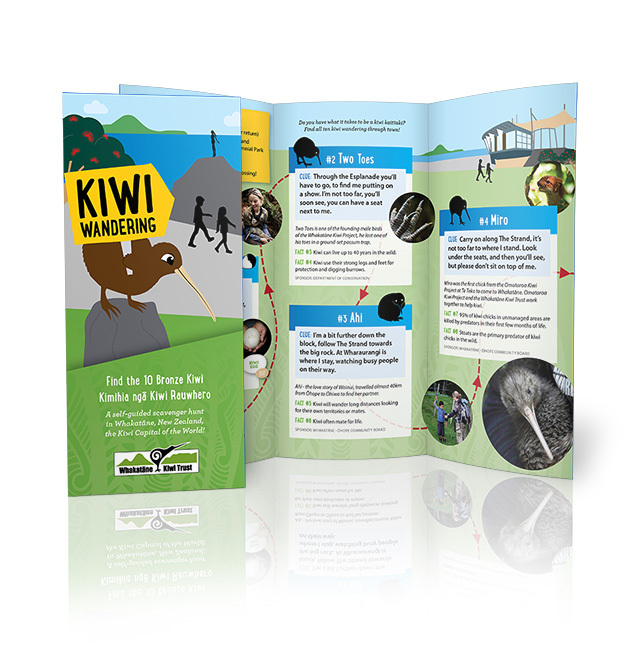 You can pick up a brochure with the clues from the i-SITE or Te Kōputu a Te Whanga a Toi – Library and Exhibition Centre, or download it here. Whakatāne’s kiwi sculptures were brought to life by the hard work, skill, and aroha of artist Dr. Liz Grant. 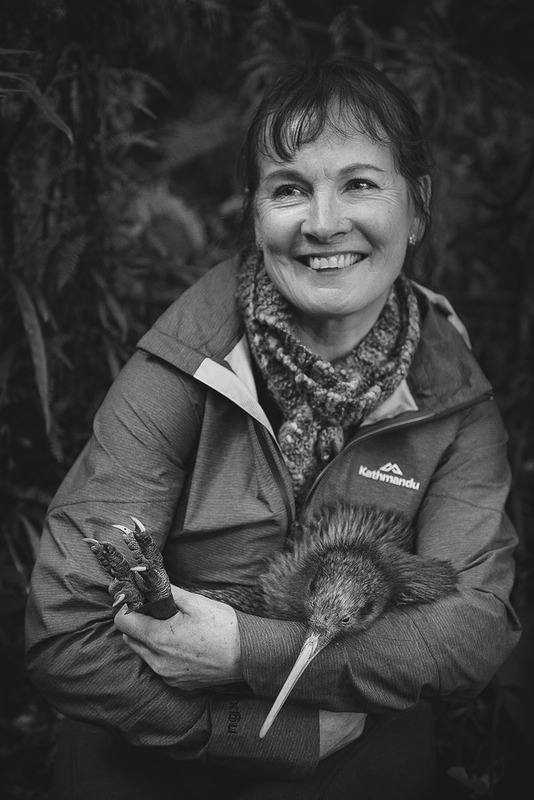 Liz has degrees in both zoology and fine arts which meant when the Kiwi Wandering project was looking for someone to create life-like, life-sized bronze kiwi, all the stars aligned with Liz’s proposal.